It’s day 3 of our Paper Christmas Decor series. 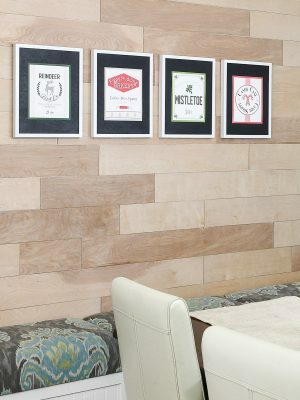 Today’s post is more for entertaining and gift giving than decorating, but still wonderful place to save money this year! 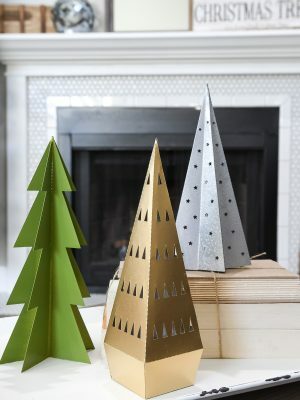 And for more ideas, I have 19 more Amazing Paper Christmas Decor Ideas here. If you like to give the gift of homemade cookies, candies, or treats for Christmas, then this post is perfect for you! Make your own cookie packaging out of these easy DIY cookie box templates! Nothing makes me happier than answering the door to a friend or neighbor holding a plate of their favorite treats. It’s such a sweet way to say “I was thinking of you this holiday season”. After spending a couple days in the kitchen preparing goodies to deliver to our loved ones, I always want a fun way to deliver them. Buying bags and boxes can add up to $5 per delivery. I don’t have extra money for that, especially at Christmas time. 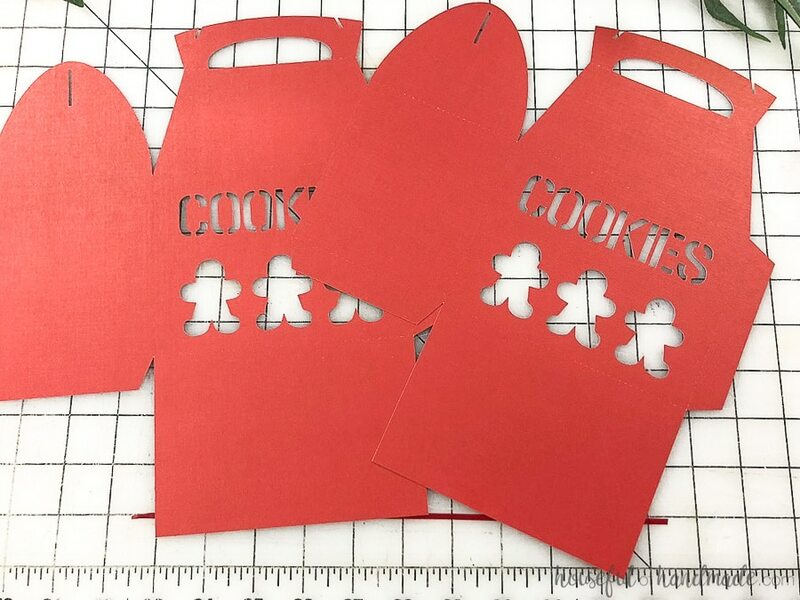 Instead, I can grab a 50 sheet pack of cardstock for $3 and make 25 of these gift boxes for cookies. 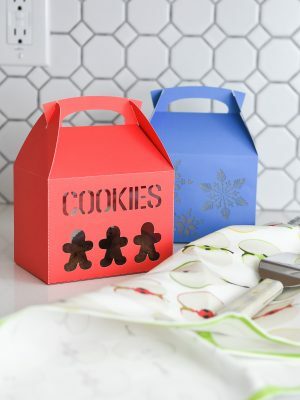 Or to make things even cheaper, make a cookie box out of a paper grocery bag. 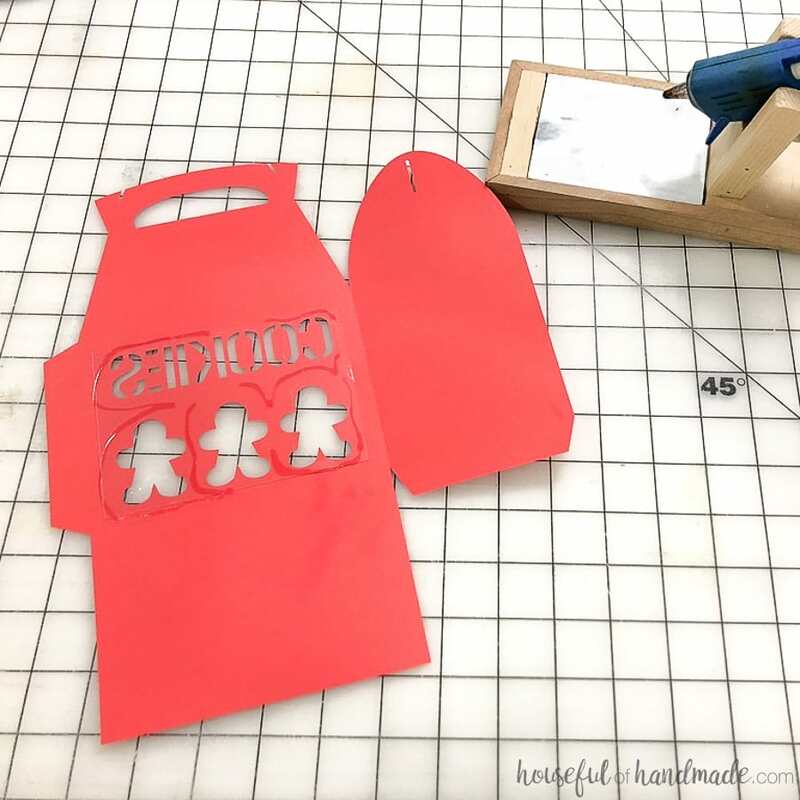 They are not as sturdy as the cardstock, but would work perfectly for lighter goodies (like my favorite peanut butter caramel popcorn, yum!). I think the best part of these Christmas cookie boxes is the handle. Once you package up your treats, the handle keeps them secured. And when it’s time for delivery, it’s easy to grab them and go! So get that mixer going and warm up the oven. You are going to be needing to make lots of cookies this Christmas season. 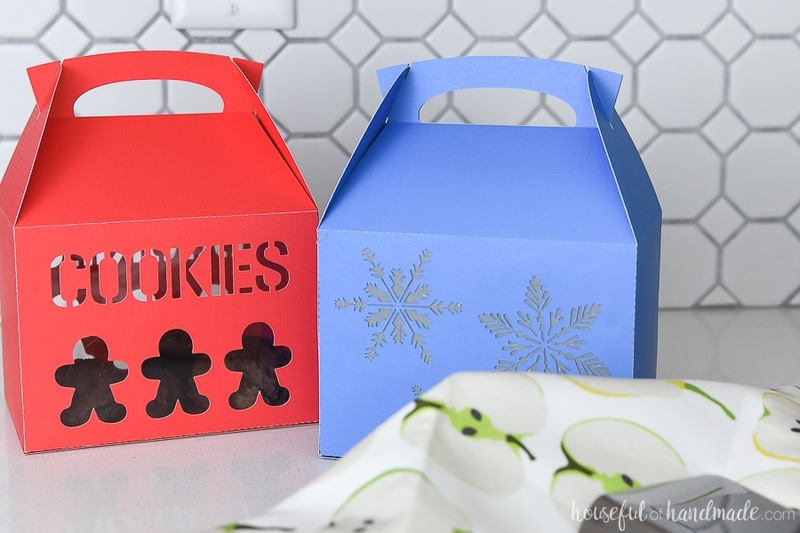 And check out these other fun DIY cookie packaging for more options: Easy Cookie Gift Boxes DIY and Printable Cookie Boxes. 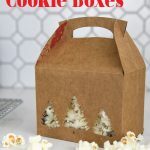 The cut files & PDF for these cookie box templates were free to my subscribers until 11/25/2018. Now they are available to purchase in the shop. Make sure to subscribe so you will be notified of new freebies! The grocery bags make a slightly less sturdy treat box, but I still filled it with a dozen small cookies and it worked. This is used to close up the decorative opening in the front/back of the box. Cut 2 of the DIY cookie box templates out of matching paper for each box. Boxes made with the 12×12 template are 5 1/2″ wide x 3 1/2″ deep x 7″ tall. Boxes made with the 8 1/2×11 template are 4 1/2″ wide x 3″ deep x 6″ tall. You can resize the cookie box template to fit your needs. Make sure to lock the aspect ratio so it resizes the width and height the same percent or things will not fold together correctly. 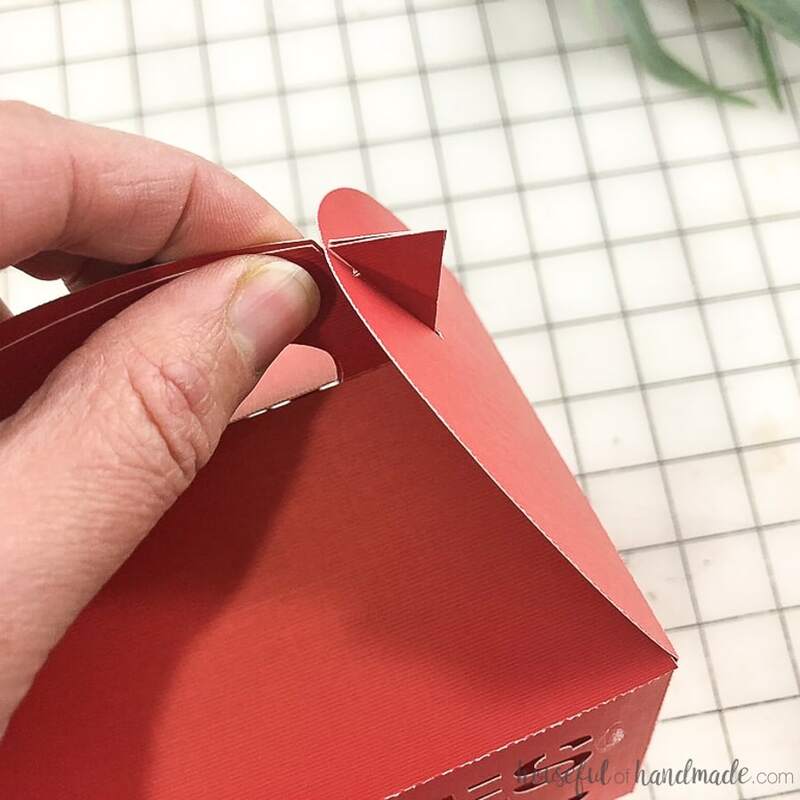 Cut a piece of thin plastic or vellum to cover the decorative opening in the treat boxes. Glue it over the decoration. I used hot glue for the thin plastic sheets and a regular glue stick for the vellum. Lay the box templates flat and glue the flap on one side. Then Flip it over and glue the other side. Then glue down the flaps to one side of the bottom. Finish by glueing the second bottom flap to secure it and give your box extra strength. To close up the top, pinch the two handles together and slide the hole in the side flaps over the notches. 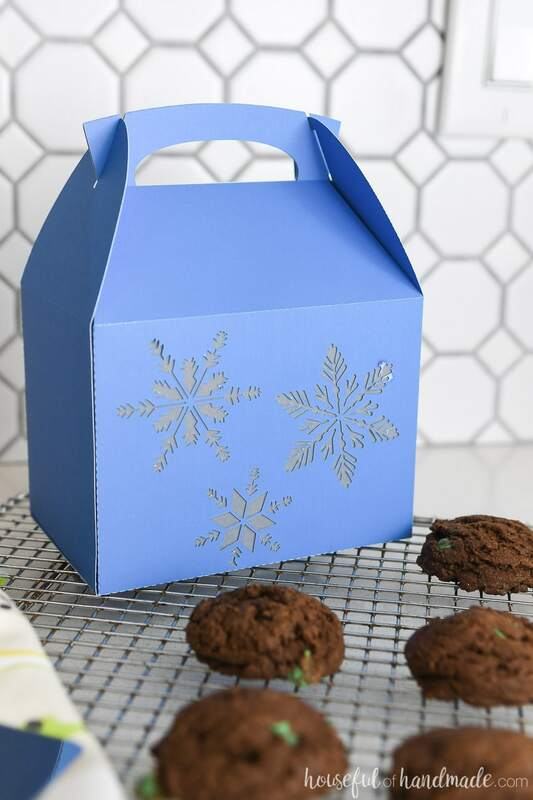 These DIY cookie packages are so quick to make, you can whip them up while the cookies bake! Then you are ready to package them up and spread Christmas cheer! Don’t forget to come back tomorrow for Day 4 of the 7 Days of Paper Christmas Decor. Here is the plan for the week. You won’t want to miss out on anything! Getting ready for a cookie exchange next weekend. These will be perfect. Thank you for the files. 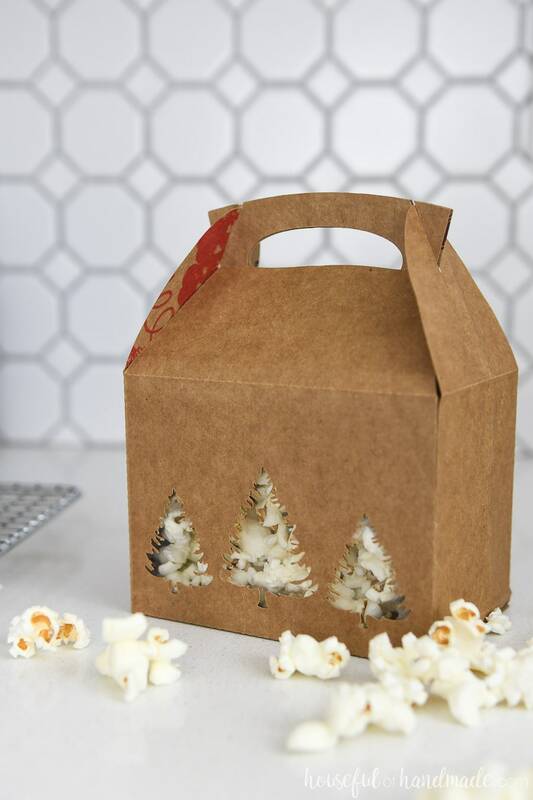 These boxes are too cute … cant wait to make them. Thank you. Thanks Yuni! I love how they turned out.